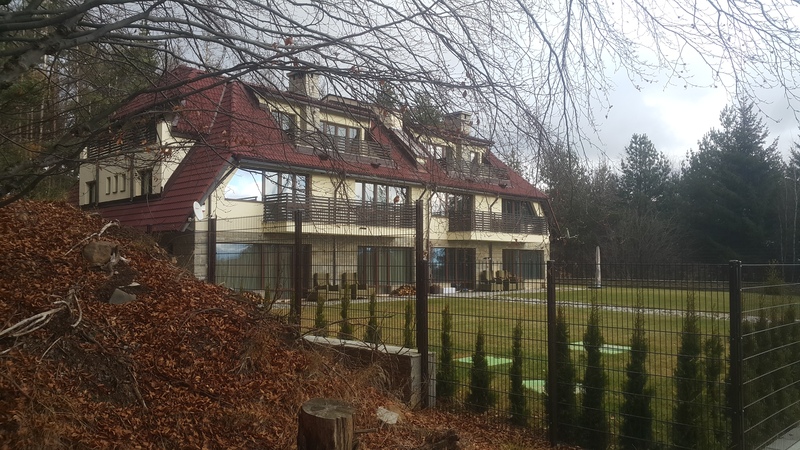 Aside from a free apartment, the godfather of Bulgarian Minister of Finance Vladislav Goranov has also provided the latter with a luxury villa in the “Yarema” villa zone, a check by Bivol reveals. The impressive building belongs to Snezhana Sarieva, the wife of the godfather Ivan Sariev. Vladislav Goranov often visits the villa and neighbors say he even oversaw its construction and gave instructions to the builders. The villa in “Yarema” (see location here) has been built on two of the three land plots that Snezhana Sarieva bought on November 13, 2003, from the municipality of the town of Samokov at a price of BGN 8-10 per square meter. During that same time, Ivan Sariev also acquired property in the area – a two-story villa for just BGN 3,000. He later bought out the land on which the villa had been built by paying the Samokov municipality BGN 3,600 for 1,188 square meters. Thus, for a modest amount the family acquired four plots in the dense pine forest area, 30 minutes by car from Sofia and about the same from the spa resort Belchin Baths. There is another intriguing fact – the properties in the villa zone itself are not in the Cadaster, as opposed to the properties outside it. This makes it harder to find the owners. One of Sarieva’s land plots has been sold later without a markup to the husband of Nina Petkova Stavreva. In 2007, the latter became Chief of Staff of the Minister of Finance Plamen Oresharski, and in 2014 she was Chief Secretary of the Council of Ministers. Stavreva, however, forgot to declare the acquisition in 2007. She did not declare it until 2014, together with a villa built on the plot, valued at BGN 336,000. In 2012, Sarieva obtained a building permit for villas on the two of the land plots left in her possession. As can be seen from the history of Google Earth, construction works had begun before 2014. The two twin houses were put into exploitation with Act 16 with No. V-608 and V-609 of June 26, 2018. In the process of the construction, Vladislav Goranov has appeared many times on the spot, according to the site Frognews, in two publications, dated October 2015 and April 2018. He was even photographed by a Frognews team which spoke with local people who confirmed the frequent presence of the Minister and his wife at the property. Bivol sent questions to Minister Goranov through the press office of the Ministry of Finance to clarify the situation as to his connection with the property of his godparents. Has he invested in the building; is he using the property and under what conditions? No response was received by the time of the publication of this article. So far, Minister Goranov has not provided explanations for the rent-free apartment he is using, despite Prime Minister Boyko Borisov’s call from Brussels to do so. The luxury apartment of 180 square meters in the “Este Home and Spa” development is owned by Sarieva. In 2011, she has paid for it BGN 382,560 to the company “Este Properties”, whose owners are the wealthy Domuschiev brothers. Goranov had been living in the apartment without paying rent since 2012 but did not declare this benefit in kind until this year. It emerged three days ago that the Prosecutor General had ordered a probe into crimes under Art. 283 and Art. 304b of the Penal Code in connection with Goranov’s rent-free home. The probe has been assigned to the Committee for Combatting Corruption and the withdrawal of illegally acquired property (KPKONPI) (sic). Meanwhile, Bivol revealed that in February 2015, one of the two sons of Ivan and Snezhana Sariev, Hristo Sariev, began work at the Ministry of Finance as a junior expert and as such has participated in committees deciding on the winning bidders in public tenders. At that time Vladislav Goranov was Minister of Finance in the second Borisov government. Who is the generous godfather? Goranov’s godfather is Ivan Hristov Sariev. He is the son of the lieutenant colonel Hristo Sariev from the Communist regime’s secret services, State Security (DS). Sariev Senior is the DS recruiter of Petko Russinov – one of the emblematic “red” millionaires of the transition period after the fall of the regime and the person who privatized the Bulgarian “Ocean Fishing“. Subsequently, precisely Russinov sold the fishing port, along with the whole adjoining infrastructure in Black Sea city of Burgas to the former live-in girlfriend of Boyko Borisov – Tsvetelina Borislavova. Ivan Sariev has graduated from the Sofia Military Academy “G.S. Rakovski”, but has not pursued a military career. He has an IT business. In 2002, Sariev joined the management of the State-owned company “Information Services”, of which the Ministry of Transport is in charge. At that time, the Transport Minister was Plamen Petrov from the National Movement for Stability and Prosperity, (NMSP) of Prime Minister and former Tsar, Simeon Saxe-Coburg. Petrov rose to fame over “that” picture where he is seen together with murdered smuggler Ivan “The Doctor” Todorov on Spas Roussev’s yacht in Monaco. Again at that time, the Parliamentary Secretary of the Ministry of Transport was the very young Delyan Peevski, then NMSP member. During the next, Three Party Coalition government, Ivan Sariev was an advisor to its Finance Minister, Plamen Oresharski, who is also a former Prime Minister. Sariev has been a lecturer on “information management” at the notorious Sofia Library College, often associated with former agents of the DS and circles around Ahmed Dogan, the Lifetime Honorary Chairman of the Movement for Rights and Freedoms (DPS), largely representing the Bulgarian Muslim minority. He, however, is most famous as a prominent Freemason boss and the unifier of the split Bulgarian Freemasonry in the United Grand Lodge of Bulgaria (UGLB).